Sail Alaska’s Inside Passage with views of glaciers, peaceful fjords and native wildlife as you cruise aboard the Azamara Quest. Visit Sitka, where you’ll find authentic 18th-century architecture set in stunning natural beauty. In Ketchikan, take a historic walking tour, learn about totem poles, or visit Tongass National Forest and beautiful Misty Fjords. Skagway is all about the Alaskan gold rush; don’t miss a hair-raising ride on the historic White Pass narrow-gauge railway. 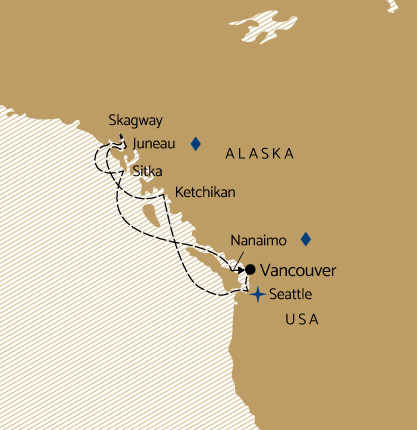 10 nights aboard Azamara Quest cruising the Inside Passage from Vancouver (Canada) with port calls in Seattle (USA), Ketchikan (Alaska), Juneau (Alaska), Skagway (Alaska), Sitka (Alaska) and Nanaimo (Canada). Includes on board meals and entertainment.